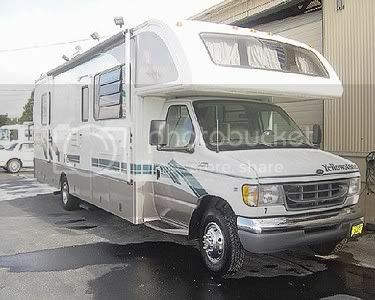 I rented an RV and I am looking for people to share it with . It's a 31' Yellowstone with a slideout. I'm looking for two or three more people to join along and share in the wondefulness. It's got a shower, toilet, kitchenette and lots of sleeping space: a queen bed in back, a queen over the cab, and doubles and singles that fold out from the couch and dining table! The RV will be in Burnstream Court, a camp dedicated to Airstreams: Specifically, the 'hood of non-Airstreams. Camps just got placement: we're at 3:00 and Fate. I am caravaning from Portland leaving Saturday, the 26th evening/night. I have early entry, so if all of us have early entry, then we're good to go straight in. Otherwise, I can join the party outside the gates. I will be leaving shortly after the temple burn to get back to Portland mid-Monday. I booked this back in early March, so I got the winter rental rates. Compared to the current summer rental rates, it's pretty darn reasonable. If anyone is interested, please let me know and we can discuss further. Phone or Email works equally well.